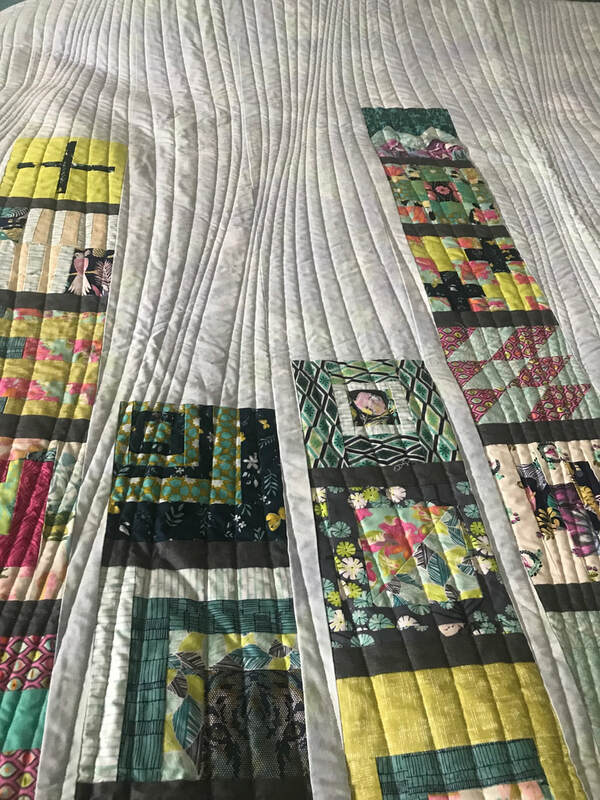 The Naperville Riverwalk Quilt Guild, founded in 1994, is celebrating 25 years of fostering the art of quilting through fellowship, education, philanthropy and community outreach. In anticipation, the 2017-18 RQG board approved and funded a request by Sue Damitz, Special Events Chair on behalf of the Fabric Fondlers Bee to design and create an Opportunity Quilt, in a modern design, to be raffled off at the 2019 Quilt Show. The concept behind the quilt was to have a pattern that allowed guild members to participate in the creation of the blocks. 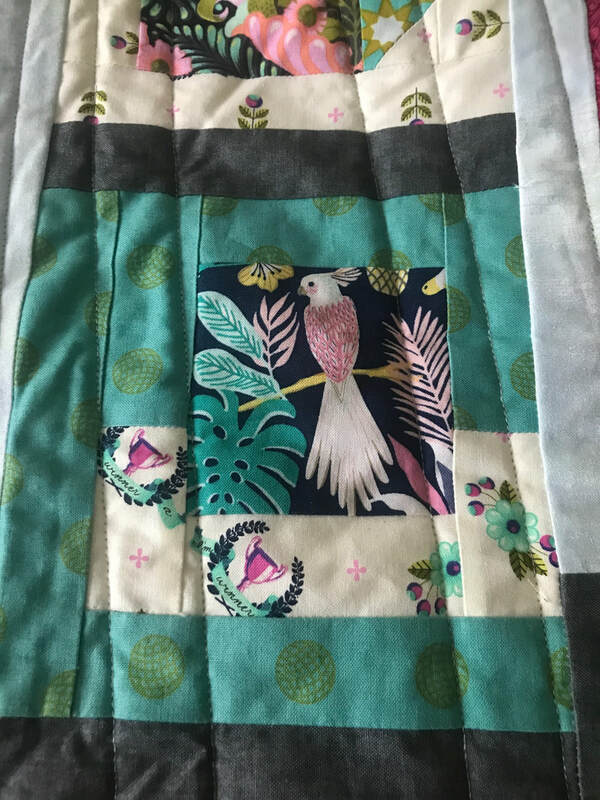 The Fabric Fondlers Bee coordinated the design and making of the quilt, over 50 guild members made quilt blocks and Robert Cornella (“Long Arm Bob”) owner of Quilters Quest generously donated the long arm quilting. 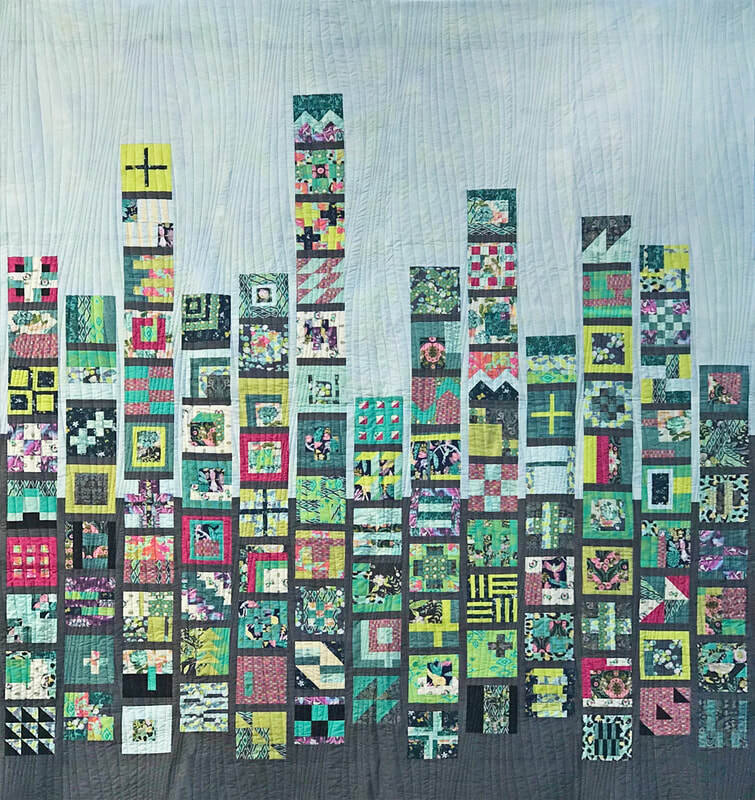 The Opportunity Quilt, “Summer in the City”, was inspired by Tula Pink’s “Skyline” layout from the book, 100 Modern Quilt Blocks – Tula Pink’s City Sampler. The quilt measures 90” X 100”. “Summer in the City” will be featured at Quilters Quest in Woodridge, IL https://www.quiltersquest.com from March 8-31, 2019. You can purchase 6 raffle tickets for a $5.00 donation and by doing so you will have a chance to win a $50 gift card from Quilters Quest. The opportunity quilt will then move to the guild’s quilt show on May 10th to join the show’s other raffle items. The drawing for “Summer in the City” will be held at the May 14 guild meeting. For information on the 2019 Riverwalk Quilt Show, visit the show webpage here. Many thanks to all who participated in the making of “Summer in the City”!